Joan Rivers in 1987. Getty Images. The recent death of Joan Rivers has brought to light the contribution she has made to the cause of women in entertainment – and she did it in her own way and she did it in the ‘80s. My first introduction to Joan Rivers was on “Entertainment Tonight” where it seemed they regularly talked about her appearances on “The Tonight Show with Johnny Carson”. By the mid-80s she had become a regular guest host, especially when Carson was on a break. That would all change with one fateful decision. It was 1986 when 20th Century Fox was planning to launch a new television network, America’s fourth, in 1987. They approached Rivers to do a late-night talk show, obviously based on the success she had achieved on “The Tonight Show”. She would become the first woman to have her own talk show on a major network. Unfortunately, nobody bothered to tell Carson. “The Late Show Starring Joan Rivers” debuted in 1987 with the launch of the new network, and it was directly opposite “The Tonight Show”. By then, Carson had banned Rivers from “The Tonight Show”, something that was honoured by Carson’s next two successors Jay Leno and Conan O’Brien. Worse yet, it was a short-lived experiment. After challenging Fox executives, she and her husband who was the show’s producer, were both fired in May of 1987. She would rebound before the end of the decade with a daytime talk-show entry called “The Joan Rivers Show”, which won her an Emmy soon after. The other outstanding thing from the 1980s was a best seller she penned called “The Life and Hard Times of Heidi Abramowitz”, which was a book about her fictional stand-up character of the same name. It went on to become a best seller that was eventually made into a TV special. Again, I heard about much of this on “Entertainment Tonight”, because we rarely got any of this stuff on peasant vision. Still, Joan Rivers was a well-known commodity, and we did get to see her in action during our summer holidays when she guest hosted “The Tonight Show”. She went on to do more TV, some of it with her daughter Melissa, more stand-up, and she hosted pre-awards shows for the Golden Globes and the Oscars. The last few times I saw her, she was guest hosting on The Shopping Channel, selling her own lines of cosmetics, clothing, and jewellery. The day after her death, one of the TSC hosts dedicated his show to her memory. 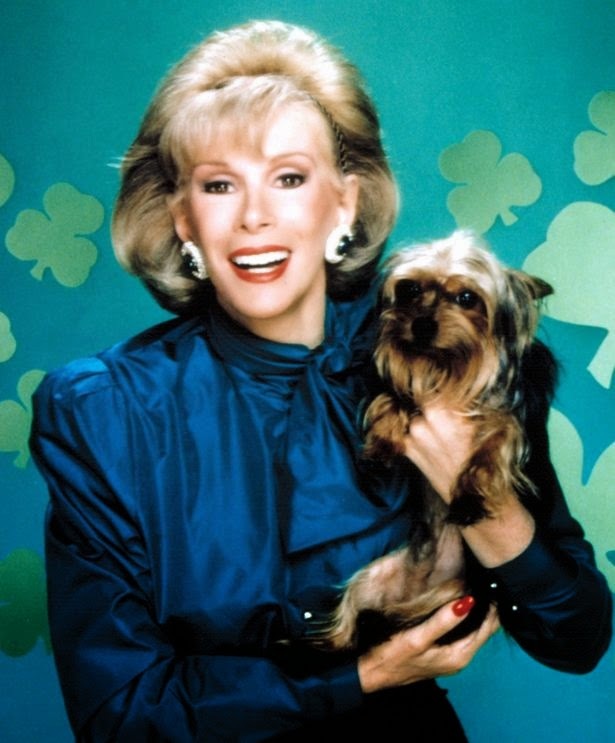 Although I did not really hear a lot of Joan Rivers in the 1980s, and actually saw her more the past decade or so, I was left with one lasting impression: she said whatever was on her mind and really was not afraid to offend anyone. It may have got her in trouble – and even fired – but it also made her a leader and a trailblazer. Much has been written about the talk show wars, revolving around personalities such as Carson, Leno, David Letterman, and more. Since then there have been others such as Conan O’Brien, Jimmy Fallon, and the like. Absent from all these conversations, and the lists of hosts, are any notable women. Joan Rivers was the first to have her own late-night show on a major network. Sadly, she remains one of the only, and maybe the only. Yet her legacy in this arena is unmistakable. She set the stage, and for that all aspiring women in the entertainment industry should be thankful.